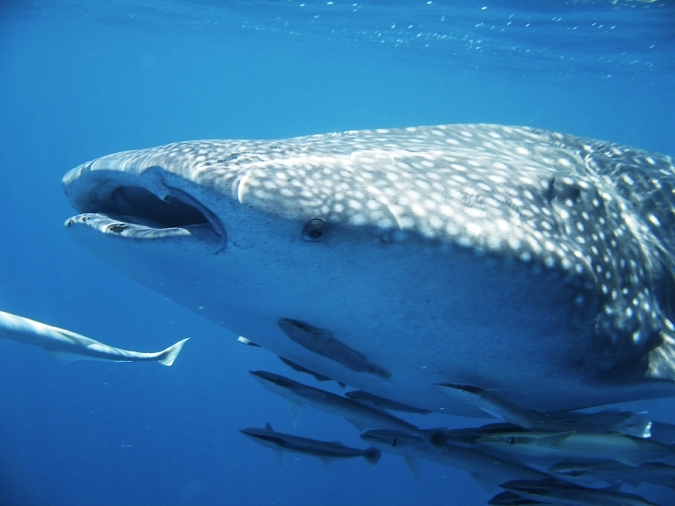 The most magnificent of finned animals emerges from the deep, the whale shark, its vivid pattern identifying each individual. They are now recorded around the globe as enthusiasts monitor their adopted animals! As the largest extant fish, this peaceful embodiment of sharkdom parallels those present-day whales and extinct reptilian "whales" by filtering the plankton from upper levels of the oceans. It has strange, tiny teeth too, for no known reason it seems. Popular wherever it is observed, this species and the smaller basking shark exploit one of the most fruitful food chains ever. At 13m (42 feet) and 22,000kg (47,000lb), it uses its 3mm prey to build up massive reserves of fat. The unforgettable sight of that amazing chequered pattern rising from the waves like an overgrown Aphrodite could never be forgotten. They have prominent ridges and yellow spots along the body too, while the first dorsal fin is larger than the second, further down the body (see the pic. above.) You can see them extending their already-extensive warm water range nowadays as global warming helps them to feed further towards the poles at current boundaries such as the Gulf Stream limits. They can live, we think, for 100 years, but as they take 30 years to mature, they are at risk At the moment Taiwanese (they are dubbed "tofu sharks" there) and other demand seems to be unending, despite the vulnerable tag attached by IUCN. and CITES listing. The lack of protection has triggered the following of individuals to try and estimate some population figures. 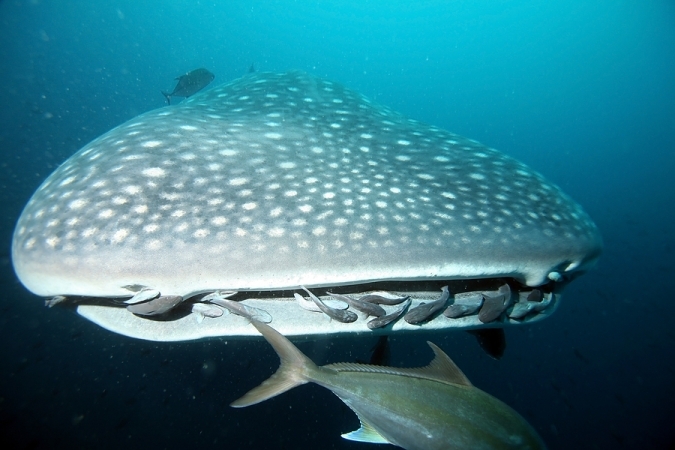 At least 400 whale sharks have been seen together, (Afuera aggregation) off the Yucatan peninsula, eating the small tunny. Large females carry many embryos, but we know of no mating sites or areas where young can grow to the size required for breeding. It looks quite bleak for the species when "uninhibited" fishing is openly tolerated, despite bans in both Taiwan and the Philippines. 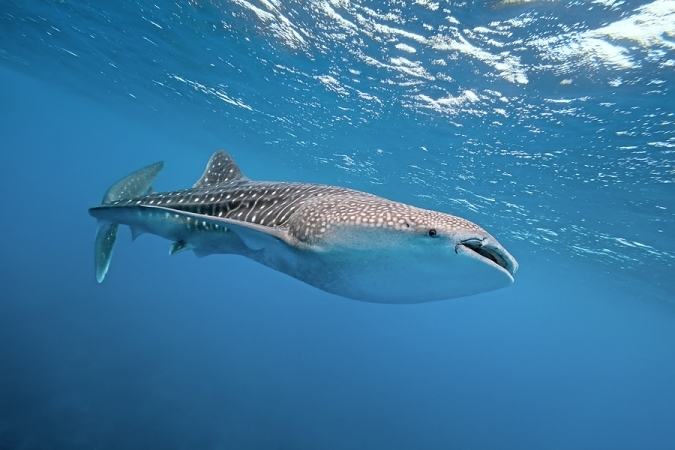 Although scientists dispute phylogenies, the bottom-living zebra shark seems the whale shark's closest relative, and this docile smaller relative is also popular with enthusiasts. We have to remember that these animals evolved so long ago that most of their relatives tend to be extinct. Thank goodness that some cultures revere them and admire their size and beauty. Otherwise, it could be an end to a long evolution for one of the most unique creatures we have ever been privileged to see on earth.